Here we find the snake called "Anaconda" this is the Amazon river and we are in Peru.Ive been told by Natives that this snake reaches well over 100 feet.However I have never seen one over 30. There have been stories of 30 foot snakes being found in this very spot where we sit.Lets get to shore and Ill tell you about them.The river is starting to recede due to the dry season.Pirahana are biting now so like I said keep your hands out of the water.The birds are very beautiful sitting high in the tree tops.Something hits the bottom of our boat.Uh what was that?A caimen.How big?No one saw.Well we are almost to shore lets paddle a little faster shall we?Set up your tents and then meet me here.O.K.Now that its dark Gather round the campfire and let me tell you a story about past explorers and their experiences with these giants. Early settlers from Spain called these snakes "el matatora" the bull killer, and said they reached well over 60 feet.But what do you think? In 1920 Raymond Ditmars of the New York Zoological park offered $1000 to any one who could supply him with an anaconda skin over 40 feet. 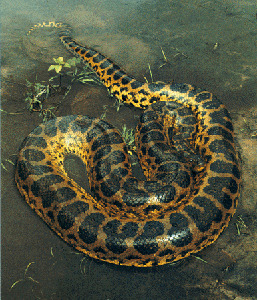 Did anyone claim the prize?Well many tried.In 1962 W L Schurz in Brazil reportedly captured an anaconda which measured 27 feet.The girth of this animal was taped at 44 inches!The weight was not recorded but it was estimated at 450 pounds. Roberto Lamon a petroleum geologist told of meeting up with this giant reptile.One day while his company and himself were working on the Orinoco river he called for a luch break.They sat down on the banks of the river to eat.Suddenly came the frantic call SNAKE! !They looked up to what was an enormous snake coming out of the water.They immediately started shooting at the serpent and waited for the writhing snake to cease.When apparently dead the men jumped in the river and pulled the snake to shore.It was then measured with a surveyors ruler.It measured 37 feet 6 inches!They finished eating lunch and went back to work.One decided to go back and skin the snake for evidence of its collosol size but upon returning the snake dissapeared!It was so large the bullets only stunned it.It is out there somewhere!This would have been the largest acurately recorded anaconda ever!But we will never know! More commonly the largest anacondas are found to be between 17 and 25 feet when captured.Many tribes worship this snake and it is sacred to them!Although it takes quite a few to capture and contain one!Hey there goes one now! Do you think there are super anacondas in the wild?Maybe a snake unkown to modern science lurking beneath the murky river terrorizing villages?Hmm its something to think about.It has a name its called securiji gigante!It is a supersnake.It can break trees with its crawl and can weigh a ton!A myth or an ancient dinosaur still to be uncovered by todays man.Keep it in the back of your mind for now it just may dwarf all of the snakes we now think are giants!! Did you ever hear the story of Francisco Barreto?Apparently he was trying to untangle his fishing netin NW. Brazil when he was attacked by a huge anaconda about 2 feet wide!The following day he was found washed up on shore the flesh of his skin torn away and his chest crushed.Since the incident the "Monster" has been spotted on several occasions.Anacondas have been known to eat large caimen and huge boars!Weighing 200 pounds or more!Sadly this snake is beginning to dwindle in numbers in the wild.There may be a time when these snakes do not exist!That would be a shame for they are truly a spectacle and a jem of an animal.Since its dark we should get some sleep and explore in the morning.So here we go.Anacondas like to bask on land after a meal.And thats probably where we will find one today.There is so much mud around here!L@@k theres one! From here we head west to Africa!